Bet the 76ers to win the Eastern Conference for 11/4 at BetHard. Bet the 76ers to win the NBA Title for 12/1 at 888Sport. Sometimes playoff positioning is just as important as the seed a team earns at the end of the regular season. Take this year’s Western Conference for example: As of Thursday, just one-half game separates the No. 5 seed and No. 8 seed, while the Warriors and Nuggets are also within a half-game for the top spot and homecourt advantage throughout the playoffs. Teams jockeying for position rightfully want out of the No. 8 spot, but if the Nuggets catch the Warriors and earn the No. 1 seed, the West’s No. 7 seed and a first-round date with Golden State becomes the worst possible outcome. But we’ll save the West for another day. The point is that matchups matter. 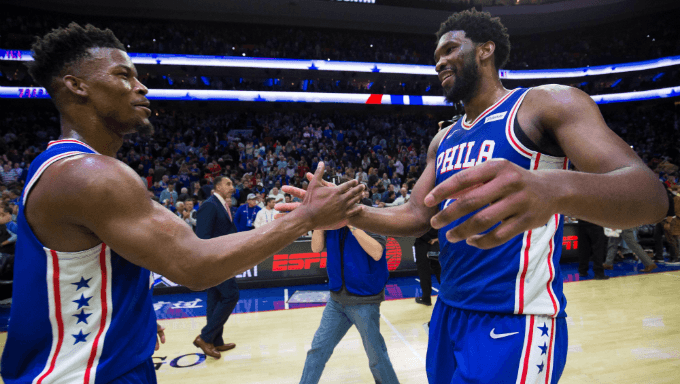 And with the recent tear the Philadelphia 76ers have been on, they’re putting together what could be the best possible scenario for them and NBA betting as they gun for a Finals berth. There isn’t a hotter team in the Eastern Conference as the regular season winds down. The Sixers have won six straight games – double any other East team’s current streak – and are doing it with an offense that appears to be finding chemistry at the perfect time. Additions of Jimmy Butler and Tobias Harris meant adapting on the fly but the Sixers have started to put it together. During this winning stretch they have the No. 4 offense. It’s no surprise that it coincided with the return of Joel Embiid, who missed two weeks with knee soreness. Since his return the Sixers are 6-0 and Embiid has averaged 29.6 points and a whopping 17.0 rebounds, including a 39 and 22 night in a win over the Celtics on Wednesday. Philadelphia is just 3-3 against the spread in this span but eight of their final 10 games are against teams with losing records so there’s potential for lopsided wins and covers in the near future. The Sixers’ six-game win streak has vaulted them past the Indiana Pacers for third place in the East. With three weeks left in the regular season they’ve got a three-game cushion on Indiana and a four-game cushion on the Celtics. They’re also four games behind the Toronto Raptors for the No. 2 seed, meaning they’re essentially locked into the No. 3 seed. That’s important for two reasons. As it stands, Milwaukee has a two-game advantage over Toronto for the top spot in the East and holds the tiebreaker on the Raptors. In other words, the East’s top three seeds are set: 1. Milwaukee, 2. Toronto, 3. Philadelphia. The Sixers wouldn’t have to face the Bucks until the Eastern Conference Finals, and avoiding the top seed and MVP frontrunner as long as possible is a good thing. Even though the Sixers are 1-3 against the Raptors this season, they’ll gladly take that matchup instead of Milwaukee. The third seed is also important because it means the Sixers will avoid the Celtics. Over the past two seasons the Sixers are 3-11 (.214) against the Celtics and 101-49 (.673) against the rest of the NBA. That includes the Celtics thumping the Sixers in a five-game second round playoff series last season. Avoiding Boston in the playoffs will give the Sixers a mental edge, and if they wind up meeting in the East Finals it means the Celtics knocked off the Bucks in Round 2, and that’s good news, too. So the Sixers’ path at least to the Eastern Conference Finals looks good. Toronto’s no slouch in Round 2 but it’s easier than seeing the Bucks, and Philly will get either Brooklyn or Detroit in Round 1, which will be a nice and easy series. For those reasons, the Sixers look like good value to win the East at 11/4. The key to beating the Warriors – or at least keeping a series close – is the ability to match up. At some point you’re going to have to play their game and their style. For the Sixers, general manager Elton Brand has equipped his team to do just that. They’ve got ridiculous defensive versatility with Butler, Harris and Ben Simmons. Joel Embiid is as tough a cover as there is in the NBA and the Warriors don’t have a true center. J.J. Redick has a potential hot hand to answer the Warriors’ infamous runs. The Sixers also beat the Warriors this season in Oracle Arena, so there’s somewhat of a mental edge there. Part of beating the Warriors in the postseason is actually believing you can do it, and having already won in Oakland the Sixers would enter a potential series with some confidence. We wouldn’t advise betting against the Warriors in NBA Finals betting, but Philadelphia’s star power and ability to match up with Golden State gives them solid value at 12/1 to win it all in 2019.